On Saturday, Monnmouth Park will open for business but it won’t be business as usual for the old track in Oceanport. This year’s Monmouth summer meeting is being touted on their website as an “elite race meet.” State officials hope the fifty-day, weekends-only schedule, plus $50 million dollars in purses, will generate increased attention and subsequent revenue from the gambling public. Monmouth Park opened in 1946. Prior to the current facility, two other race tracks in the area operated under the name Monmouth Park. The first conducted a meet from 1870 to 1872. It closed due to financial problems and stood idle for 10 years. In 1878, prominent horse owners and breeders George Lorillard and D.D. Withers along with James Gordon Bennett, publisher of the New York Herald, purchased and restored Monmouth which had fallen into disrepair after years of neglect. After four years of renovation, the track opened again for racing in 1882. In 1889, plans were announced for a new facility. That track — in close proximity to the original — opened in 1890 to much fanfare and was touted in 1897 as “…the finest racecourse ever constructed…” Unfortunately, it was short lived. Just a year after opening, the anti-gambling faction in the state forced Monmouth to move its meet to New York’s Jerome Park. Racing commenced again from 1892 to 1894 but the tide had turned against racing. Newspapers, like the New York Times, once supportive, began publishing negative stories about Monmouth, claiming that “men and women of no character are freely admitted to the grounds.” In 1894, New Jersey doomed racing in the state by passing a law that banned wagering. I have always been curious about the precise locations of the original Monmouth Parks. After locating two maps and a somewhat obscure history written by an army historian, I identified the location of the 1870 Monmouth and have a general idea on the location of the one built in 1890. Current map with the a location of the Monmouth Park that opened in 1870. The label for the 1890 track is an approximation. The current track is visible on the right. Print from the Library of Congress showing the grandstand of the original Monmouth Park. Likely depicting the track sometime between 1870 and 1872. Program cover from the inaugural 1890 meet -- the second incarnation of Monmouth Park. The grandstand held 10,000 fans and was the largest in the country when it was built. This source claims the 1890 track was located on the current parade grounds of Fort Monmouth. However, if they were using the faint outline on the aerial image above as their primary piece of evidence, a few measurements using Google Earth proves that outline could not be the main oval, which was described by the New York Tribune as being a mile and three-quarters (hard to imagine a track larger then Belmont’s mile and a half). It is likely that the current parade ground was part of the land purchased for the 1890 track but the precise location of the grandstand and primary oval remains a question. If anyone knows the precise 1890 location (or has a better idea based on the images and maps above) , please leave a comment or shoot me an email. A big thank you to Hal for taking the time to send along this information. Melissa Kozlowski, “Fort Monmouth and the Jersey Derby,” 2005. This is a strange source. It was selectively useful but also has some egregious errors, the worst of which being the claim that the Jersey Derby moved south and became the Kentucky Derby in the 1890s. Ouch! What is really awful about the Maryland Jockey Club’s decision to include the Preaknesses that were run at Gravesend and Morris Park is that the 1890 faux Preakness at Morris Park was for 3-year-olds and up, and the winner was a five-year-old named Montague. That makes that otherwise undistinguished equine the oldest horse to win a Triple Crown race. In addition, that race was run the same day as the Belmont. Looks like I am not the only that thinks counting the New York Preaknesses in the official history of the race is silly. Allan Carter’s opinion is gold when it comes to racing history and I thank him for allowing me to quote from his email here. I remain you greatest fan. Thanks for the MP entry! I believe there is a picture of the gates to the original grandstand hanging in the clubhouse today. The plaque below states the gates stood on Park Avenue in Long Branch. If that is true the original location of MP is about 2 miles south-east of the current track. Looking at a local map right now. There is a Park Ave off Broad Street/Rt. 71 in the precise area you have identified above as the 1870 location; just west of the intersection with Main St. You can see it just below the “1” in 1870 on your map. Perhaps this entire area was known as Long Branch in 1890? Or the sign in the club house is erroneous. In either event, it makes sense now. (And there is a Park Ave. in Long Branch/Elberon, which is what has always thrown me off, until now.) Sorry for the nerddery! Hi Helene. Thanks…your comments are always good for my ego. My book, “The Trail of the Blue Comet,” published in 1993, is a history of the rail lines that served the track. There is a capsule history of both tracks drawn mostly from local newspapers, along with vignettes of resort life in various towns that depended upon the railroads in the 19th century. I was able to combine surviving maps of both tracks into a composite map showing not only the courses but their rail connections. 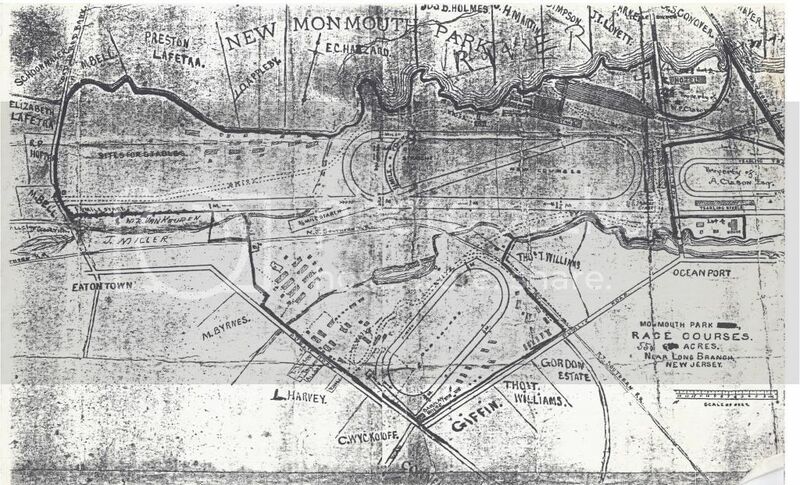 The 1890 track had a main oval but also a diagonal straightaway, which is probably what shows on the parade ground, and another longer straightaway running almost east-west parallel to the New Jersey Southern Railroad. The grandstand roof was under-designed and collapsed under the weight of a heavy snow in Feb. 1899. Unfortunately, I don’t remember what newspaper or magazine the original map of the 1890 track was in. The book was a limited edition for railroad enthusiasts and is now a collector’s item. There should be copies in a few local libraries, such as the Rutgers New Jersey Room, the Ocean Grove Historical Society, Monmouth College Library and the Long Branch Public Library, which we gave then in return for using their photos, that is, if they haven’t disposed of them. I am a diehard fan and live in Eatontown. I love the rich history of it. Anytime I bring a friend or new guest to Monmouth I take them on my own historical MP “tour”. I show them where the old gates were on Broad St, where MP1 grandstand was located and where the 2 old tracks were located (from outside the fort gates). I have gathered some nice photos and arcticles including a map showing MP 1 & 2, and a nice quality photo of the old gates. This photo, along with the one they have at MP now, does not show the top ornate part of the gate like on MP’s logo and now I wonder if it was ever really there… email me at eatontown@hotmail.com and I will forward to you. According to one arcticle, the ticket booth and any other MP items on fort property were removed in 1927. I was putting together a research project and have visited most local libraries. There is very little info available. I went to MP to try and speak to someone who might know of any archives, but no one was willing to help me. I was turned away and looked at like I had two heads. I was not surprised as I was dealing with NJ state employees. definitely on park ave in eatontown off of 71-537. i live on the former site of the grandstand and my nosy kids have dug up old pieces of brick and horse shoes in the front yard. Here is a map that shows the location of the 1870 and 1890 tracks. Thanks for all the information and the maps. I am writing a family history about 19th century racing in the New York area and would like to use your map of the 1870 race course. Would that be ok? I will of course acknowledge your website.